Police in Suffolk have issued over 300 Traffic Offence Reports (TORs) after targeting drivers of heavy goods vehicles as part of an operation which coincided with a two-week nationwide seatbelt enforcement campaign. 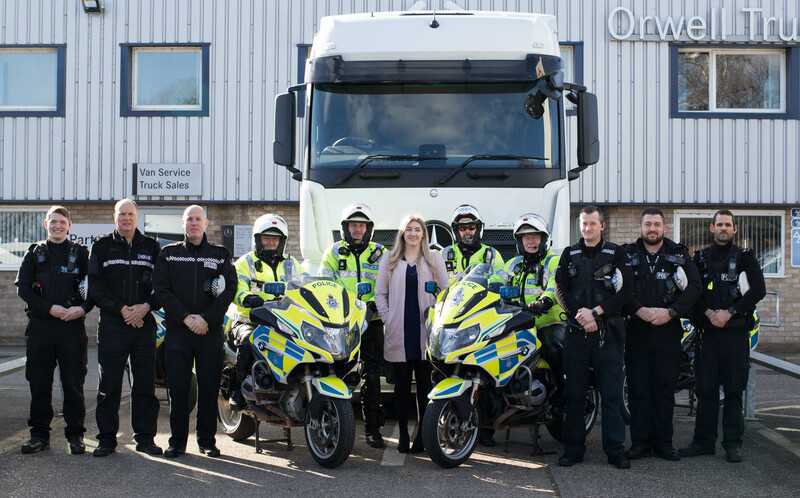 As part of Operation Wyken, police were provided with a cab section of an HGV from Orwell Trucks, which allowed officers to carry out patrols on the A14, A12 and A11 targeting motorists including lorry drivers. This took place between Monday 11 March and Wednesday 20 March. This ran in conjunction with both a two-week National Police Chiefs’ Council seatbelt campaign (11-24 March) and a week-long Europe-wide TISPOL campaign (11-17 March). The cab, which was driven by a police officer, provides an ideal vantage point meaning officers can look into cabs of other lorry drivers or looking down at cars or vans. A team of roads policing officers accompanied them to stop any offenders. A total of £36,150 was recovered in fines. Sergeant Julian Ditcham, of the Roads and Armed Policing Team and who led the operation, said: "Due to the physical height of commercial vehicles, it is often difficult for patrol officers to view into the cab and thereby detect offences such as not wearing a seatbelt or using a mobile phone. "The HGV cab provides officers with an ideal vantage point to spot drivers committing offences and provides us with another means to enforce the law with this specific group of road users, who due to the size of the vehicles they are in control of, pose an added risk to other motorists and also themselves if they are committing offences whilst driving. “Wearing a seatbelt can prevent many collision-related injuries and fatalities and it is compulsory for drivers to wear them, and they should ensure their passengers buckle-up too. Using a mobile phone distracts drivers and increases their chances of being involved in a serious of fatal collision. Suffolk’s Police and Crime Commissioner, Tim Passmore, said: "I fully support the Constabulary’s campaign to crack down on irresponsible drivers who still refuse – despite all the public messages - to buckle up whilst driving, but it amazes me that drivers should need to be reminded about something so obvious. Seatbelts should be worn in any vehicle they are provided in, including buses and goods vehicles. Anyone caught not wearing a seatbelt may be issued with a TOR (Traffic Offence Report) and face a fine, points on their licence or even court action.